This is the thirty sixth in a series of reviews of the best dive resort locations around the world. In this post, the focus is Curacao. Background – Situated 65 kilometers (41 miles) north of Venezuela, Curacao is the C of the ABC islands (Aruba, Bonaire and Curacao) of the Dutch Antilles. It is more populous than the other two with 160,000 citizens and is a constituent country of the Netherlands. Unlike the other two, historically it was a slave trading center and today has a greater diversity of cultures with a majority of the population having African ancestry. Within its 444 square kilometers (171 square miles) is a smaller island to the southeast, Klein Curacao (Little Curacao). There was no gold to attract the early Spanish explorers and salt mining was one of the original economic activities. Today tourism, international trade and finance, oil refining and shipping are the major drivers of the economy. The capital Willemstad has a free trade zone and the island is a major port for cruise lines. Prostitution is legal, though local women are prohibited from participation. Dutch, Papiamento (a Creole language) and English are the national languages with Spanish usage common. Most people can speak at least two of these. Organized sports are popular and quite a few from Curacao have made their way to major international leagues in baseball and soccer. Krioyo, the local cuisine, reflects Dutch, Chinese, Surinamese and Indonesian influences, among others. There are many interesting historic structures and UNESCO has declared Willemstad a World Heritage Site. 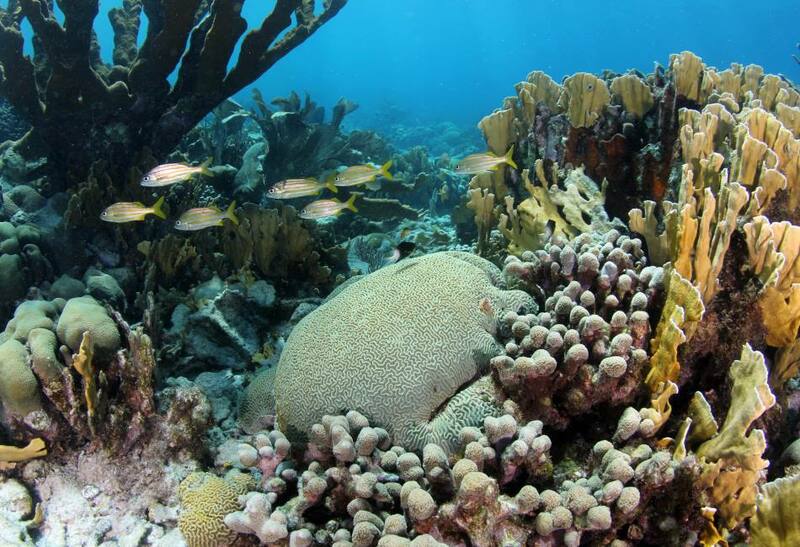 Undersea World – There are lots of diving opportunities around Curacao with over 60 dive sites, 40 of which are shore dives. Surrounding it is a fringing reef rich in hard and soft corals, large barrel and tube sponges, gorgonians and other invertebrates and reef fish. The terrain includes rocky shores, bays and beaches with a reef drop off close to shore in the south. There are deep walls and a number of wrecks that Curacao is famous for. Most of the diving is on the west side which generally has smooth surface conditions, minimal current and good visibility. There is a significant effort in reef building and a protected marine park off the south of the island. 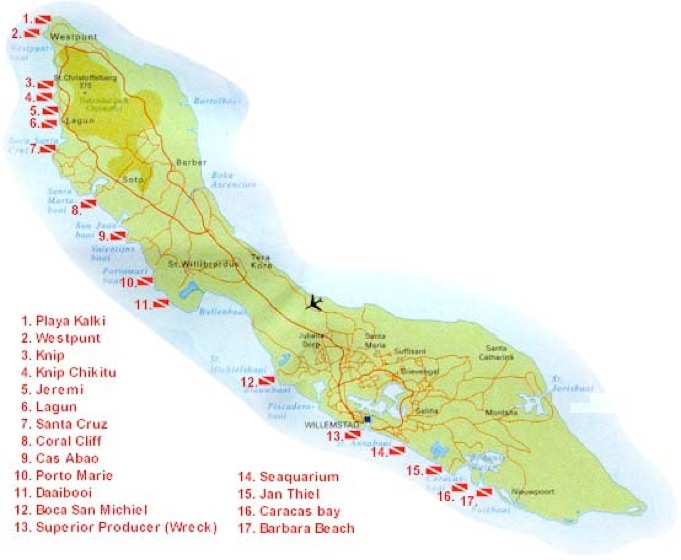 More than a dozen major dive shops are mostly along the west side to do courses, rent equipment and guide with the bulk on the southern half with its sandy beaches. Macro life includes octopus, seahorses, frogfish, mantis shrimp, anemones and lobsters. There are large French angelfish, morays, jacks, snappers, grouper, turtles, barracuda, nurse sharks, manta and eagle rays, dolphins and pilot whales. The east has stronger current and choppier surface conditions with fewer people diving there. Klein Curacao, to the southeast, has interesting diving with strong current on the east side, lots of soft and hard corals and huge caverns on the tips with nurse sharks inside. Turtles nest on the sandy beaches and big schools of wahoo, barracuda and snappers are often sighted. Around Curacao there are dives to suit all levels of diver. Seasons and Conditions – Diving is good year round with some seasonal variation. The dry season is from April to November when it is dry, sunny and calm. Air temperatures have an average high of 32°C (89°F) with water temperatures at around 28°C (82°F). From December to March is the rainy season when brief downpours occur daily. Temperatures are a little cooler with an average air temp of 29°C (85°F) and water temp at 26°C (79°F). With water temperatures like this many divers will go with a lycra suit or a shorty. Curacao is on the southern edge of the hurricane belt and massive storms usually bypass it. Visibility is usually excellent in the range of 15-30 meters (50-100 feet). The west side has little if any current and smooth surface conditions while the east side often has strong currents and substantial surface chop. Curacao is not an area renowned for liveaboard diving, but there are many cruises in other areas around the Caribbean. Click here to book a Caribbean liveaboard holiday. Regular flights from other Caribbean and North and South American countries and Europe fly in and out of Curacao International Airport daily. Taxis from the airport to Willemstad run $40-50. Taxis are not metered and a 10% tip is expected. Cars, motorcycles and bicycles are for rent. The public bus system is limited. There are large buses for longer journeys that depart roughly once an hour and collective cars or vans for shorter routes. Aside from seaside activities and beaches, Curacao has a very rich and diverse culture to enjoy. There are many historic buildings and sites, museums, galleries, gardens, an aquarium, shopping, the old market, forts, unusual bridges, an ostrich farm, a flamingo sanctuary, Carnival (just after New Year’s), Christoffel National Park with Indian cave paintings, iguanas, white-tailed Curacao deer, mountain hikes with scenic photogenic views and great restaurants with Curacao’s multicultural cuisine. Great review of Curacao, with a little about history and culture, and of course the scuba diving. The Superior Producer is a fabulous wreck – what clear water and great encrusting sponges and corals and quite a few fish. It looks like they have a lot of things to do after diving and the multi-cultural lifestyle is exciting. I’ve met people from Curacao and they are so friendly. I hope to get a chance to go and check things out. Thanks a lot for the review. You’re very kind. I hope you get the chance to go. If you do, please write and let me know how you like the diving and the whole scene there in Curacao. Hi Joe! That’s cool! I didn’t know Aruba, Bonaire and Curacao where called the ABC Islands! It really sounds like an interesting place not only for the diving but also for the rich culture and history. I love the fact that diving is good year round! I am a little busy until next Fall. Maybe I can consider going then. What sounds most interesting to me as far as the diving goes would be a trip to Klein Curacao. I’d like to take a look at those caverns with the nurse sharks. Good to see you again, Henry. Thanks for your continued interest and kind comments. If you go next Fall or thereafter, please give me a review of the trip and tell me about those caverns. They also have the turtles nesting on Klein Curacao, as well. Thank you for the informative post. Personally, I like traveling as it is one of my best hobbies and also working with the airline industry I find it easy to book for vacations easily and maybe at a relatively low price, so this makes it easy for me to travel. To be truthful I have never been to a diving activity due to fear, though I really wish I could gain the courage to join in, I believe it’s very interesting going deep down the sea and see a lot of this that maybe I can now only watch on Google and YouTube. I am sure to come back to your website to learn more from your posts as I am really interested in taking part, especially when it comes to the Caribbean, I have heard a lot about it, thank you for sharing this post. I have learnt a lot. Thanks for your interest and kind comments. For me, too, Curacao is a very interesting place. If you would like more information about the Caribbean I invite you to take a look at my other posts. Also, If you would like to give diving a try, please get in touch. I can give you some details about what it involves. You only need a few days to get a diving certification. Really interesting read on Curacao Scuba Diving, but unfortunately I am not a diver and I think I don’t really have must interest to try. Curacao seems very interesting, though, as it has many interesting activities other than scuba diving and places to visit like the ostrich farm, flamingo sanctuary, museums, forts and so on. What really caught my interest is Christoffel National Park with Indian Cave Paintings, since I am from India, I feel really happy. Thanks a lot for your interest and kind comments. Actually the Indian cave painting is by the original natives of Curacao that unfortunately people call Indians. It is a little confusing and an inaccurate name, I know. I’d like to try to convince you to give scuba diving a try. There is what is called discover scuba diving where you can learn a few key facts about diving, practice some skills in a pool and then go for a very closely supervised dive in the ocean in shallow water. It would give you a feel for it and perhaps you would decide to go further. They could do it with you at any dive shop in Curacao and in many other places. Without the diving it sounds like you could still have a great time in Curacao, I think. That’s great! I hope you can get your certification and make the trip. Thanks a lot for your interest and good luck. I have always found wreck diving to be fascinating especially when there is a good story or one knows a little history about the vessel. My diving has mostly been in the Atlantic ocean and it is incredible to see the difference in sea life based on the water composition and temperatures. Are these vessels restricted to those who have the wreck diving qualification or can someone with an advanced divers certification visit these vessels? Thanks a lot for your interest and questions. 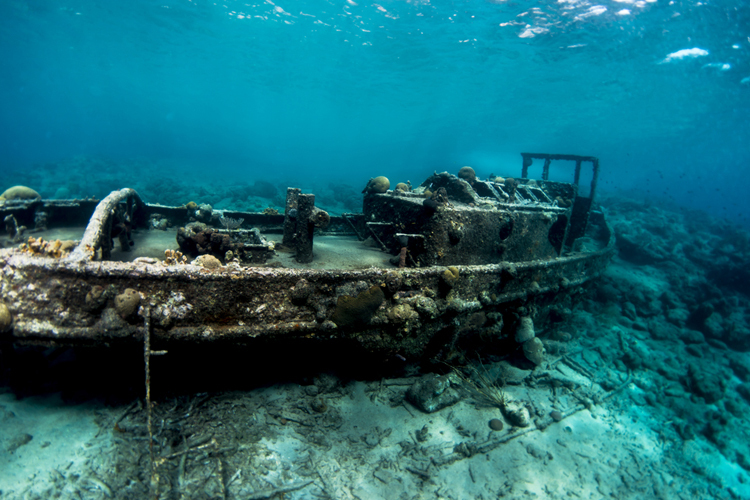 The wrecks in Curacao are all relatively open and reasonably shallow. An advanced open water diver certification is enough for all the wrecks there. It really is a much different array of life in Curacao compared to the Atlantic. If wreck diving interests you, I invite you to look at my other reviews. Practically all areas these days have some wrecks to explore. If you have any questions or comments, please get in touch.